This recipe is specifically posted for Christina, my cousin Jesse’s wife. They came to visit us in California and, after I had served the Meyer Lemon Tart as well let slip about this food blog, Christina asked if it was going to be posted here. Well, Christina, here it is. And the rest of you can read it too. I made this mostly by accident. Shortly after making the Meyer Lemon Sorbet, some one at work left a bag filled with Meyer lemons in the kitchen area. Given the success the previous recipe was, I snatched up more than my fair share (I initially took less but when there were some left over as I was leaving, I grabbed a few more). To make me seem like an even worse person, the Meyer lemons have sat in my fridge since then. After awhile, I decided that it was finally time to do something with the Meyer lemons. While more sorbet always is good, I wanted to do something different with them. So I finally decided on this recipe because I like tarts and Angela likes lemons (there’s a joke in there somewhere but I can’t quite find it). I’m pretty sure this is the only recipe I’ve ever made that required more than a dozen eggs. This recipe is not for the faint of heart. It is rich and over-the-top. It uses just under a pound of butter, a good amount of sugar, and the previously mentioned eggs. But, then again, when you’re going to do something, you might as well do it right. As you might’ve guessed given the prior statement of a recipe request, it was pretty good. To me, it was the perfect balance between lemon, sweet, and tart. Angela though it wasn’t tart enough (but she’s wrong). We didn’t need to eat a lot of it as a small piece was quite enough to suffice. It went quite well with the Lucas & Lewellen 2005 Late Harvest Sauvignon Blanc. Allow 1 cup of butter to soften then cut into tablespoons. In the bowl of an electric mixer, cream together the softened butter and 1/2 cup sugar. Add 1 egg yolk and the milk and mix to combine. Mix the flour with 1/4 tsp salt and then slowly add it to the electric mixer. Continue mixing until the flour is incorporated. Divide the dough into two balls, cover with plastic wrap, and refrigerate for at least 1 hour. Reserve one ball of dough for a future use. Grease a 10-inch tart pan. Remove the dough from the refrigerator and roll it on a lightly floured surface to 1/8″ thickness. 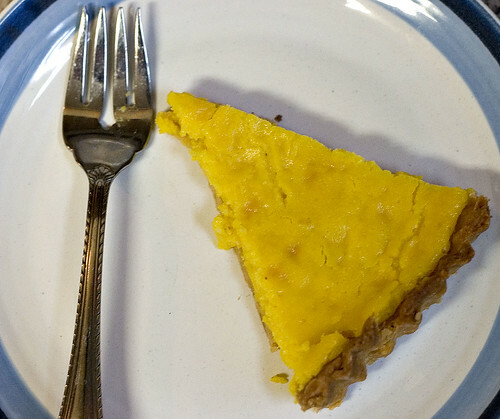 Place the dough into the tart pan and prick the bottom with a fork. Place the pan in the freezer for 30 minutes. Preheat the oven to 375ºF. In a nonstick saucepan, place the lemon juice, lemon zest, 1 cup sugar, 11 tbsp butter, and 1/8 tsp salt. Cook over medium heat, stirring occasionally, until the sugar is dissolved and the butter melted. In a bowl, combine the whole eggs and the 7 remaining egg yolks and whisk until well blended. Temper the lemon mixture into the eggs slowly. Return the lemon and egg mixture to the saucepan. Heat the saucepan over low heat, stirring constantly, until the mixture thickens to a pudding like consistency. Remove from the heat. Strain the lemon curd into a bowl. Remove the tart pan from the freezer. Place a sheet of aluminum foil over the tart shell and fill with pastry weights. Bake for 10 minutes. Remove the aluminum foil and pastry weights and bake for 10 to 15 minutes or until the tart shell is golden. 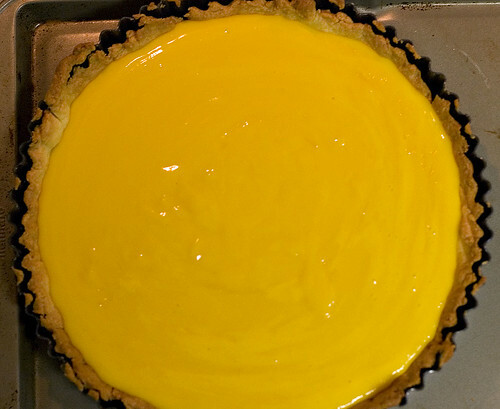 Pour the lemon curd into the tart shell and smooth with a spatula. Bake for 30 minutes.